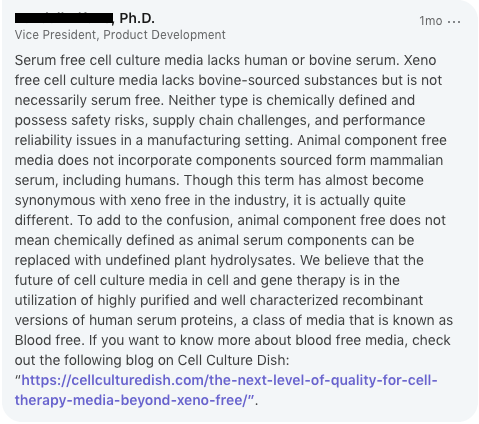 > Scientific Blog > Resources > What Does ‘Serum-Free’ Mean for Your Cell Culture Media? What Does ‘Serum-Free’ Mean for Your Cell Culture Media? What does serum-free mean? The question was brought up during a lunch at the World Stem Cell Summit in January. Is it clever marketing or is there a scientific definition to the term? By the end of lunch, the table of cell culture media experts could not come to a consensus on how the term was defined. Was the rest of the scientific community as confused as we were? Does anyone know what “serum-free” means? Cade Hildreth of BioInformant, the world’s largest stem cell industry blog, set out to find the answer. If you follow BioInformant you may have seen the poll question in your feed, but if you don’t, the results may be surprising. What Does Serum-Free Media Mean? The question was brought up after examining current “serum-free” products on the market. Does it mean free of FBS? Or does it mean xeno-free – absent of all animal components? Is it defined or chemically defined? One thing was obvious: the definition of serum-free was different across various companies in the cell culture space. So what does serum-free mean to you? However, when the same question was asked on the BioInformant LinkedIn page, there was no specific answer that stood out as the clear winner. Some agreed on no serum at all as their definition with some conditional variations such as serum-derived components being fair game or no animal source as a restriction. Another defined “serum-free” as free of FBS. While others simply sided with “defined” as their definition of “serum-free”. Then it got complicated. This post was the root of how the conversation came about and why no one really knows what serum-free means. It would appear that while there is a lack of consensus on the definition of ‘serum-free’, the term exists because scientists are looking for certain attributes in their media.The term was born from an urgent need to find an alternative to the broadly adopted FBS for cell therapy. The advent of cell therapy has created a need for cell media that is free from as many immune response eliciting substances as possible. Naturally this lead to a ‘mandate’ to remove FBS from media due to its non-human (i.e. bovine) origin. In addition, FBS has been notorious for introducing variability into cell culture systems. The wrong FBS can introduce a degree of irreproducibility due to the variations from lot-to-lot. Lastly, the large demand for FBS has led to adulterated or counterfeit products on the market. The issues caused by FBS have prompted the innovation of better media and a call for better definition in cell culture. Every cell therapy application will have unique needs for their media, but there are commonalities amongst most people in this field. Is Human Serum the Answer? Human serum (HS) is the gold standard supplement used in many clinical/manufacturing cell therapy media. Although human serum is a better alternative than FBS, there are similar challenges that present a degree of variability and irreproducibility. Clearly, our industry does not have a set definition for what ‘serum-free’ means. The scientific community needs better alternatives that would provide better results and drive breakthroughs. FBS and human serum available were not satisfying that need which is why the term serum-free exists. The industry needs serum alternatives to address these issues because clinical usage and trials for the cell therapy space are on the rise and the amount of human serum in the world is finite. Get exclusive updates direct to your inbox.